As someone who struggles with passivity in leadership, I needed this book. Dave Griffith-Jones not only coins an important new term for our struggles—for the disobedience that masks itself as risk-avoidance—but is a gospel-saturated, compassionate call to repent of our inaction and courageously live out the life of Christ. We have made escapism a contact sport. We have so many devices and distractions to keep us busy from an involved life. This book is easy to read, full of self-deprecating humor with plenty of practical examples of people like you and me. 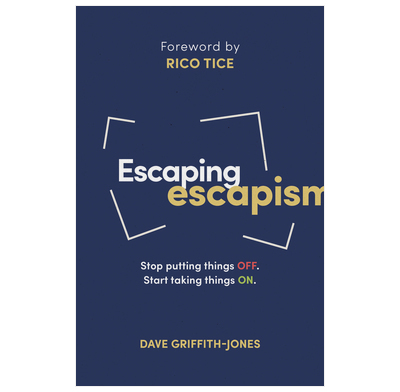 Reading a book on escaping escapism is the easy bit, but Dave explores the wisdom contained in Scripture and a relationship with God to help us in our daily lives. This is a hopeful and encouraging book. What a fine and useful book! It is a really helpful combination of contemporary perception, Biblical insight, practical advice, and an attractive and compelling style. I had not realized my own brilliant escapist ability until I read this book: and it also gave me Biblical and Christ-centered hope!